Chicago, IL—In an unprecedented partnership, Terra Foundation for American Art and the Museum of Contemporary Art of the University of São Paulo in Brazil (MAC USP) have joined forces to organize the exhibition Atelier 17 and Modern Printmaking in the Americas, along with a two-day international symposium, mini-course, and new catalogue publication. Atelier 17 and Modern Printmaking in the Americas, which opened March 23 and runs through June 2, is the first presentation of the collection of modern American prints donated by Nelson Rockefeller in 1950, and American prints donated by the collector Lessing J. Rosenwald in 1956. 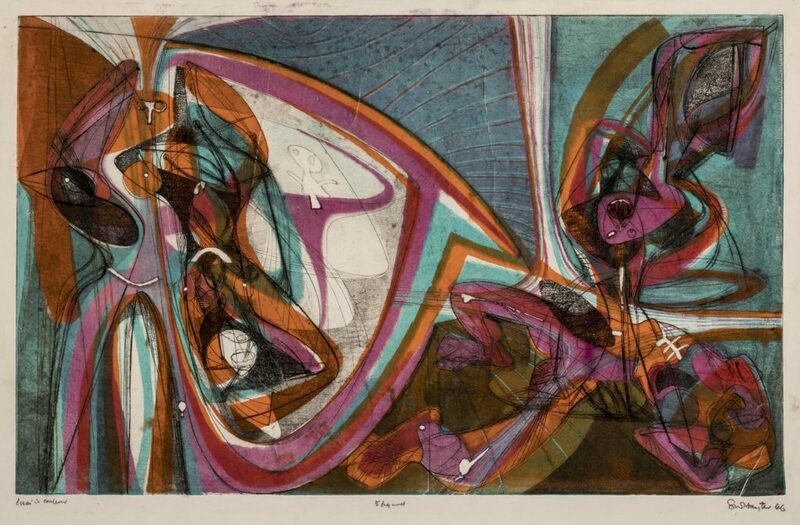 The exhibition includes early twentieth-century American prints, contextualized with modern prints by Brazilian artists such as Geraldo de Barros, Fayga Ostrower, and Livio Abramo who had direct ties to Atelier 17—a collective studio founded by British artist Stanley William Hayter, established in Paris and reinstalled in New York after German invasion of France, in 1940. The exhibition examines the intricate network of international exchange between artists, curators, collectors, and audiences in Brazil and the United States. The exhibition features nearly 60 prints from both MAC USP and US institutions, including 14 works from the foundation’s collection as well as key loans from the Brooklyn Museum and the Art Institute of Chicago. The exhibition is accompanied by a catalogue, an intensive two-week mini-course for USP graduate students co-taught by Brazilian and US specialists, and a two-day international symposium (April 11–12) examining major trends in modern printmaking across the Americas, with a focus on the practice, influence, and students of Stanley William Hayter and his Atelier 17 workshop. Hayter promoted a vigorous collaborative environment and the Atelier 17 studio was highly influential, attracting many international artists, such as Brazilians Lívio Abramo and Geraldo de Barros, whose works are displayed side by side with their American peers. Hayter’s studio was famous for its unconventional structure, in which the master-student relation gave way to an environment for experiments on new techniques and innovative printmaking methods. Atelier 17 was a place for artists from many countries and different backgrounds. Created between 1910 and 1960, a period of innovation and experimentation, the works on display in Atelier 17 and Modern Printmaking in the Americas illustrate the vast possibilities in technique, visual, method, process and material on the expanded field of modern printmaking. The exhibition has its origins in the Master thesis of Carolina Rossetti de Toledo (who curated the exhibition along with Ana Gonçalves Magalhães and Peter John Brownlee), which focuses on 25 American prints from MAC USP’s collection, donated by Nelson Rockefeller to the former Museum of Modern Art of São Paulo (MAM-SP) in 1951. This exhibition is a Terra Collection Initiative—a collaborative undertaking with publications and programs that further scholarship on the collection and make significant contributions to the study and understanding of historic American art. These projects are developed by Terra Foundation curatorial staff in concert with institutional partners throughout the world.